Sergio Garcia and Ernie Els are the latest big names to confirm their participation in this year's Irish Open at Royal County Down. World number one Rory McIlroy announced the addition of the duo to the Royal County Down field on his Twitter account on Tuesday. McIlroy's charitable foundation will be the tournament's official host. The Northern Irish star has already convinced Rickie Fowler to commit to the 28-31 May event. Lee Westwood and defending champion Finland's Mikko Ilonen will also be in the field along with Northern Irish major winners Graeme McDowell and Darren Clarke. Ricky Fowler looks forward to returning to Royal County Down to play in the Irish Open in May. World number seven Garcia, 35, took his first European Tour victory as a 19-year-old in 1999 when he held off Angel Cabrera to win the Irish Open at Druids Glen. The Spaniard was beaten in a play-off by Ireland's Padraig Harrington at the 2007 Open Championship and finished joint-second with Fowler in the major at Royal Liverpool last summer behind winner McIlroy. Els, 45, won the US Open title in 1994 and 1997 and also triumphed at the 2002 and 2012 Open Championships. Garcia will be making his first appearance on Northern Irish soil as a professional. "You could say this event is where it all began for me. I was just 19 when I won in Druids Glen in 1999, only two months after I turned professional," said the Spaniard. "Not only am I returning to a very special event, but to a venue of which I have heard some incredible things. "Royal County Down is a world-famous links and going by what Rory has been telling me, it could possibly be the best course I play this year." Els, meanwhile, is relishing the opportunity to claim a second career title in Ireland, having won the World Golf Championship event at Mount Juliet in 2004. "I haven't played in the Irish Open for a while and I spoke with Rory in Dubai recently about the event and am very happy for him that he is involved in hosting such a prestigious event," added the South African. "It is a similar role I have taken with the South African Open and it is a great honour to be able to host your national open." For his part, McIlroy is delighted by the response he is receiving from his friends in the golfing world and hopes that more big names will be lured to the event. "I was confident I could convince a lot of great players to come and play the Irish Open this year but the response so far has exceeded all of my expectations," said McIlroy. 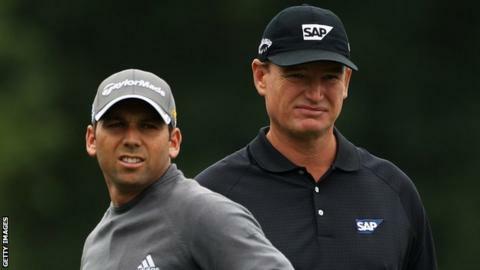 "To have Rickie, Sergio, Ernie, Lee, Darren and Graeme, as well as Mikko, already committed by February is incredible." Tournament organisers have said that tens of thousands of tickets have already been sold for the event.